I had raised this Windmill palm from a seed and planted it here in 1985. I expected the worst after minus 4F, never having experienced such a low temperature before. No green showing anywhere, but thankfully the spear wouldn't pull out after a gentle tug. No signs of life. Then two months later in March 1990 there was green spear starting to show. A few months later, the summer 1990, the palm had a grown a nice crown again. Three other smaller Trachycarpus did not survive.. The palm is still thriving. There was no damage in 1996 after a six degree freeze. No damage at 4F below zero. 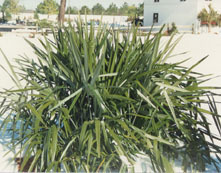 Sabal palmetto is to plant container grown material. 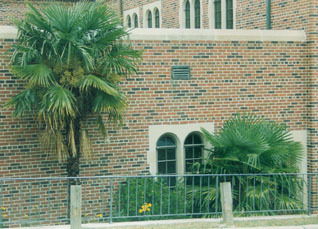 Windmill Palm ( right above ) planted in 1985 was very well established and growing rapidly. Notice a small amount of green at the top. 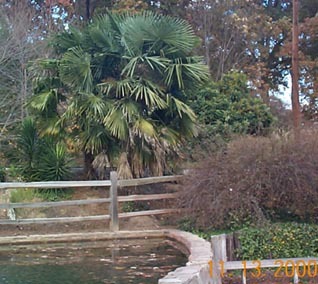 This palm completely recovered by late summer of 1990. This photo was taken in Greensboro in 1993. 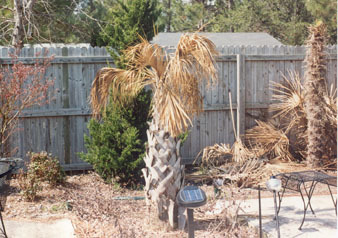 This palm survived the winter of 1985, when the low at the airport was 8 below. Being up close to this large brick church probably kept the temperature a few degrees higher. This palm has seen many single digit temperatures. 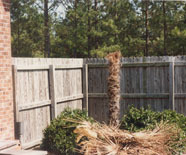 Growing in red rocky clay soil, this palm is very healthy and when this photo was taken in Novemder, 2000, was full of seed. 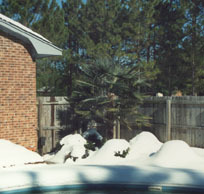 December 25, 1989 brought the coldest day in New Bern's history. Four below zero F after a weather service prediction in the teens. My orchard mercury-type thermometers recorded the same as the airport on this night. There are many times that it has been 5F or more degrees colder out here in the country than at the airport since the airport is located between two large rivers. That would have been a disaster to have been lower this time. Downtown New Bern and down the south side of the Neuse river (where the airport is located) to the coast is definitely warmer than areas to the north, south and west of town. That is the problem with using only temperature data from certain sources to make a zone map. If the source is in a micro climate, it does not accurately reflect the temperatures of the surrounding areas. A few palms in New Bern and along the river were not damaged as much as palms in other areas out from the wide Neuse River. 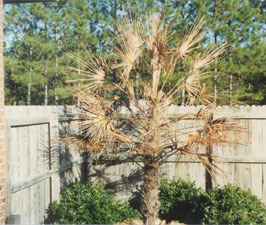 Most Sabal palmettos planted in the area were killed except ones located on the south side of houses or other buildings. Trachycarpus were all defoliated and many younger ones were killed outright. 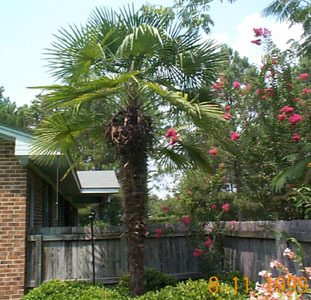 There was no damage to Needle palms and established Sabal minor. Here it is 2000 and we are going on almost 11 years of good palm growing weather, except for a 6F degree freeze in 1996 that damaged only Butia Palm.